The first thing you should have in mind is to set a theme for your guest bedroom. For most people, the whole idea of turning the extra room in the house to a guest bedroom is to provide a place for your guest to spend the night without feeling uneasy. The key in decorating an ideal guest bedroom for your guests is to provide them with sufficient privacy and at the same time, reduce personal scarification made by your household members. Before you put your hands on buying furniture for your guest bedroom, the first thing you should have in mind is to set a theme for your guest bedroom. Having a clear idea of what you need will reduce the time and cost spent on the guestroom. Lighting and wallpaper color plays a vital role in displaying the ideal effect you want for your guest room. Therefore, the first thing on the list is to pick a right color for your guestroom. For instance, if your room receives minimal sunlight, natural color such as yellow, apricot, and other natural warming color can brighten the room and create a warm, sunny effect. If the room is exposed to the warmth of the sunlight, cool color such as blue, aquamarine may be used to create a cooling effect. The color you picked should blend in with the theme and not to overpower it. Next up is to buy the right furniture for the guest bedroom. An ideal guestroom should provide the guests with a comfortable bed (or even air bed) with bedside storage and a lamp for reading purposes, a mirror, a wardrobe that provides adequate storage for your guests to keep their clothes and shoes in order, and also a luggage rack to keep luggage bag. On top of that, place a spare telephone in the room for your guest, in case your guest has anyone to call, they can do so privately. It is also recommended to place some drinking water and a couple of magazine or books by the bedside. Other than that, if the guest bedroom comes with a toilet, it should also be well taken care of. Besides providing a bright, clean and dry toilet, you should also need to ensure that the toiletries like shampoo, toilet rolls and shower gel are restocked. Last but not least, additional items such as a television set and a mini fridge can also be placed in the guest bedroom for the comfort and convenience of your guests. 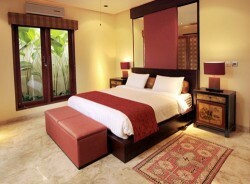 In a nutshell, the main purpose of a guestroom is to provide a comfortable and enjoyable stay for your guests. All other extra furnishings can be avoided if you think that they are not necessary.